Marathons are safe for most, but some runners may have an underlying heart condition, doctors say. (Health.com) -- Three runners collapsed and died during the Detroit Marathon on Sunday. Although that news is shocking and frightening for runners and non-runners alike, such deaths are rare, experts say. "Among young people, high school and college athletes, there's one death in about every 200,000 people [during exercise in general]," says Dr. Paul Thompson, the director of cardiology at Hartford Hospital, in Connecticut. "For older people, there's about one death in every 15,000 people. If you look at really fit people, the death rate is even lower." In fact, other activities may be more dangerous than running a marathon. "More people die from lightning strikes while golfing," says Dr. William Roberts, a professor of family medicine and community health at the University of Minnesota, and the medical director of the Twin Cities Marathon. "And it's probably safer to be running in these races than driving in a car if you think about the number of deaths from traffic accidents." The three men who died in Sunday's race were believed to be in excellent health and to have trained for the race, according to news reports. They were 26, 36, and 65 years of age. Two collapsed at roughly the half-marathon mark, or around 11 to 12 miles; the third had just crossed the half-marathon finish line. Autopsies have been scheduled to determine the causes of death, but officials suspect all three died from cardiac arrest. Two other races have been in the news this month after runners died: Two people died at the end of the Rock 'n' Roll Half Marathon in San Jose, California, and one person died at the Baltimore Marathon. "When these things happen, they get our attention," says Thompson. "Even if you're in good shape, it's no guarantee." People most at risk for cardiac arrest during strenuous exercise are those who have underlying heart problems but don't know it. Sometimes they have heart abnormalities, which may have been present since birth. "With young people it's congenital," says Thompson. "Their hearts are too thick, or their arteries come off the wrong areas." Other cardiac arrests are caused by ruptures of soft plaque in the arteries, says Roberts. Unlike the hard plaque known to clog arteries, the soft plaque may leave arteries open enough to go unnoticed. If they rupture it can result in blood clots and heart attacks, says Roberts. "If someone is habitually active, they are at less risk, but [the rupture] is still going to happen," says Roberts. "Whether it happens when you're out running the race is pretty hard to predict. We had a death at the Twin Cities Marathon once and the man had had a [cardiac] stress test a few weeks before that was normal." The last death at a Detroit event was reported to be in 1994 when a 42-year-old man died after running more than 20 miles. The race conditions in Detroit are probably not to blame for the multiple deaths, says Roberts; he says that sometimes deaths occur in clusters just by chance. 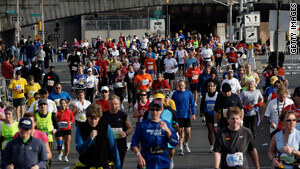 More than 19,000 people were registered in the race. Temperatures were low during the race (28 degrees at the start), but it was essentially good race conditions, as runners are more likely to have problems in hot weather. Although air pollution levels are generally higher in large, urban areas such as Detroit, it's generally safe to run anywhere unless there's a smog alert, says Roberts. Even the unusual course -- the Detroit route takes runners through a tunnel -- shouldn't have made a difference; a Hong Kong race that takes runners through a particularly long tunnel has no higher death rates than any other, he says. Marathon deaths raise a number of other health concerns related to racing. Concern around over-hydration swirled after a runner in the 2002 Boston Marathon collapsed and died from drinking too much water. Marathon deaths from drinking too much water are extremely rare -- there have only been five in history, says Roberts -- but it is possible. Excess water intake, generally by inexperienced runners worried about dehydration, can cause a potentially life-threatening condition called hyponatremia, or water intoxication. Runners should aim to drink enough water to replace just a little bit less than what they sweat out, says Roberts. To approximate that amount, weigh yourself before and after a long run. The difference is how much sweat you lost during that amount of time. "To say, 'Drink this much every hour' is really hard," says Roberts, "because of the huge variability in sweat rates in people." Be aware of how much water you drink, but don't refrain from drinking when you're thirsty just because you're scared of over-hydrating, he says. Also, before long races, runners should avoid consuming anything that could put them at greater risk of heat stroke, which includes anything that might be dehydrating, such as alcohol, caffeine, and foods high in sodium, warns Roberts. Some medications may also increase your risk, so check with a doctor. Otherwise, stick to your usual medication and eating habits. Above all, make sure you are fit enough to run. Talk to your doctor about any family risk factors like high blood pressure or diabetes, and check for potential problems, like high cholesterol, experts say. "If there is anything suspicious in your family history, review that with your physician and see if there's any workup that needs to happen before you race," says Roberts. "If you have a clean family history and you've been running all your life, you should be fine. If you've been sitting on the couch for a while, make sure your past history isn't going to catch up with you." Thompson recommends that runners pay attention to their body while exercising and be sure not to ignore symptoms that could be a sign of underlying problems. "We found about 50 percent of people in our studies had symptoms they chose to ignore," says Thompson. Those symptoms included heartburn, tightness in the chest, and tightness in the arms brought on by exercise -- all of which could be symptoms of heart problems. Still, the experts agree that it's important to not worry too much about rare occurrences. "If we worried about the rare stuff all the time, we wouldn't do anything," says Roberts. Depending on your health, perhaps a full marathon won't be the best fit, but that doesn't by any means necessitate cutting out exercise altogether. "People should be exercising regularly for their own health," Roberts says. "It's the cheapest medicine we have."